Three national pharmacy chains in the United States now offer talking prescription information for blind customers. This post has information about the Walmart, Walgreens and CVS accessible prescription initiatives. Please help us spread the word about the leadership role these companies have taken in making sure blind pharmacy customers can privately and independently access information about their prescription medications. If you are a blind pharmacy customer at these stores, please share your feedback with these companies. (Contact information for each chain below). All three companies worked on their talking prescription programs with the American Council of the Blind and ACB affiliates through the Structured Negotiations process. The American Foundation for the Blind was involved with the CVS and Walmart negotiations. The Law Office of Lainey Feingold and Linda Dardarian of the Oakland civil rights firm Goldstein, Borgen, Dardarian & Ho represented the blind organizations in the Structured Negotiations with Walgreens, CVS and Walmart. We are currently working with other retail and mail order chains to address this important health, safety and civil rights issue for people with visual impairments. Please visit the Contact Page of this website to share your feedback or for more information. Walmart was the first national chain in the country to offer talking prescription labels to its blind customers. Walmart offers ScripTalk talking labels from Envision America. Envision America provides the ScripTalk reader free of charge to Walmart pharmacy customers. Walmart offers ScripTalk talking labels through its mail order pharmacy and at a limited number of Walmart stores. You can contact the Walmart mail order pharmacy by calling toll free to 1-888-227-3403. Read the post on LFLegal listing Walmart Stores where talking labels are offered. In March of this year CVS announced that it was providing ScripTalk talking labels through cvs.com mail order to customers across the United States. 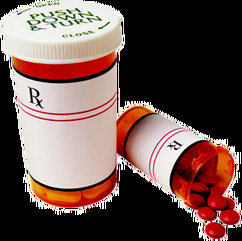 Blind CVS.com pharmacy customers can call 888.862.4363 to order their prescription medications with the ScripTalk labels. CVS is also providing prescription information in large print. Envision America is providing the ScripTalk reader free of charge to cvs.com pharmacy customers. Envision America can be reached toll-free at 1-855-773-2579 (1-855-SPEAK-RX.) Read the CVS talking pill bottle press release. In June of this year Walgreens announced it is providing talking pill bottles free of charge to Walgreens pharmacy customers with visual impairments. A new device will be provided with each prescription and prescription refill. The devices are available at every Walgreens store in the United States and through mail order. The program also applies to Duane Reade pharmacies, which are owned by Walgreens. The device was developed by Walgreens and adheres to any prescription container. Pharmacy staff records the prescription information and the customer can play it back with the press of a button. Staff has been trained to allow customers to listen to the recording in the store to assure the recording is clear and understandable. Walgreens also offers large print prescription information. Walgreens welcomes feedback on the company’s initiative. Customers may call 1-800-925-4733 extension 4. Read the Walgreens talking pill bottle press release. This is a post about companies that offer their blind pharmacy customers talking pill bottles. To find out more you can contact each company. CVS offers talking pill bottles through mail order. You can reach CVS mail order at 888.862.4363. Walmart offers the ScripTalk talking prescription labels through mail order. Walmart also provides this service at some stores. Contact Walmart at 1-888-227-3403. Walgreens offers the Talking Pill at every store in the country and through mail order. Call Walgreens at 1-800-925-4733. Return to full post.